Mario Valentini shares engaging and nostalgic stories of his childhood in the mountain villages of Abruzzo during the lean years after World War II. At the age of four, Mario is given into the care of his uncle, a priest, while Mario’s father works in another country. His uncle can afford luxuries like shoes and education for Mario, and has the rare luxury of a car in the remote mountain villages he serves. Mario recounts the misadventures that repeatedly land him in hot water with his “aunt”, a distant relation who serves as the priests housekeeper, and his early adventures in love and romance in his early teens. His child’s-eye-view of life in 1950s rural Italy is interesting and endearing, spiced with adventure–hunting wolves with a sling shot, discovering treasure in an abandoned castle’s well. Valentini and his partner, Cheryl Hardacre, collaborated to write the book, presented as a first person account. The Italian words sprinkled through the text are translated in a glossary that appears at the end, along with a childhood photo of Mario with his beloved uncle. The book was a pleasure to read, though I would like to have known more about Mario’s life after his childhood–even a brief summary. For many readers, this would be a good introduction to the rural Italy of their parents’ or grandparents’ time. 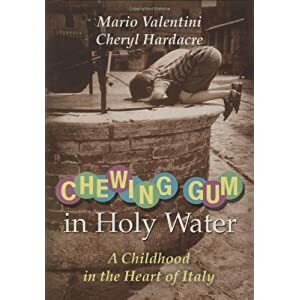 Chewing Gum in Holy Water was published by Arcade Publishing in 2006. ← Happy Liberation Day, Italy!